Harry Chapman talks with Josh Turner at Belmont University in Nashville, Tenn. September 6, 2017. 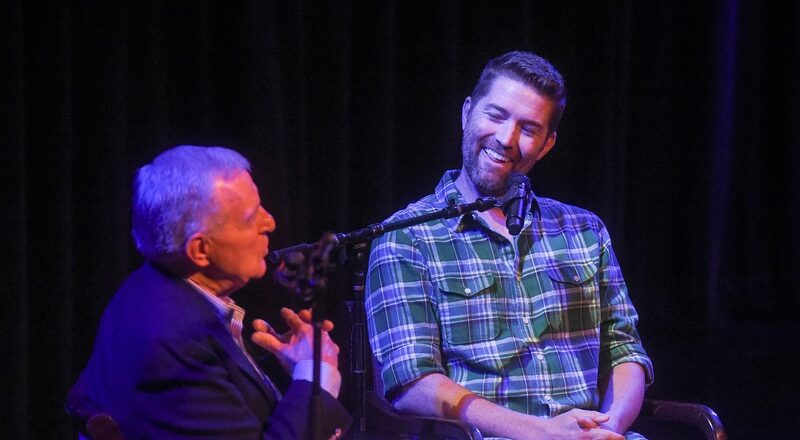 After a quick visit to check out Belmont’s new Gallery of Iconic Guitars (The GIG), alumnus and country music artist Josh Turner joined retired Director of Development Harry Chapman on the Massey Performing Arts Center stage for a chapel conversation and performance. Turner quickly engaged the packed auditorium with stories of his own time on campus and his ill-advised parking solutions. Turner signed books and took photos with students following his appearance at Chapel Sept. 6. Turner came to Belmont on the recommendation of a choral director in his home state of South Carolina and the encouragement of his parents who wanted their son to have a college education. At the time Turner simply wanted to pursue his music. Growing up, he couldn’t get enough of the rootsy, Americana, bluegrass sounds that defined traditional country. In fact, the first song he played in front of a crowd was the Randy Travis’ hit “Diggin’ Up Bones” when he was just 13. By 17, he was learning guitar and starting to write his own music, and a few short years later, he moved to Nashville and began studying at Belmont, a move that would launch his career. Turner’s wife, fellow alumna Jennifer Ford Turner, studied classical piano at Belmont and frequently tours and plays alongside her husband. Their family also now includes four sons who helped inspire the writing of Turner’s first book, “Man Stuff: Thoughts on Faith, Family and Fatherhood.” Turner also recently released his sixth studio album, “Deep South,” in March and has tour dates lined up for the rest of the year.